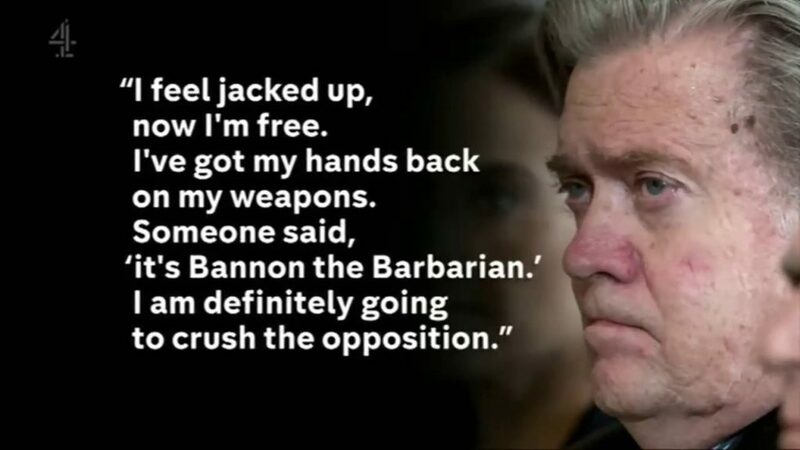 If you missed the recent “60 Minutes” interrogation of Steve Bannon, head of Breitbart News and adviser to President Donald Trump, you missed a lot – including CBS’ shameful camera antics which were clearly intended to cast Mr. Bannon in the worst possible light imaginable. * The Republican Party establishment has been taking actions to undermine the Trump presidency in an effort to “nullify the 2016 election.” This is true. And we Trump-supporting “rubes” in the heartland know it. * Leading those efforts have been Senate Majority Leader Mitch McConnell and House Speaker Paul Ryan. It fact, it comes as no surprise whatsoever that McConnell objected to the very notion of “draining the swamp” and wanted the Trump campaign to “back off” from using it. * Republicans who are openly trying to sabotage the Trump presidency will be targeted for defeat in GOP primaries next year, with Bannon leading many of such efforts. And that could well include Danny Tarkanian’s challenge to Sen. Dean Heller right here in Nevada. * President Trump’s early decision to embrace the GOP establishment right after his election – including a number of key administration appointments – was an understandable gesture that, in hindsight, was a mistake. * The Republican majority in Congress is responsible for the failures to enact the campaign promises the GOP ran on in 2016, not President Trump. They’ve had seven years to prepare for a Republican president in the White House who would sign their legislation, but have failed to get their promises to the Oval Office desk. * The Republican majority, given six months to do its job as it relates to DACA, is likely to screw that up at least as badly as they’ve screwed up ObamaCare repeal. And that failure could well cost the GOP its majority in both houses in November 2018. * White hate-mongers such as the KKK’s David Duke aren’t getting increased visibility because of President Trump, but because the fake news media keeps putting them on the air despite the fact that they are a very tiny, though repulsive, part of our citizenry. * The Russian collusion story is “a waste of time” and is only fueled by the fake news industry that has dedicated itself to destroying the Trump presidency. Most of the American people know this to be absolutely true. In addition, most of us agree with Bannon that what President Trump “does on Twitter is extraordinary.” He talks directly to the American people without the filter of the “pearl-clutching mainstream media” getting in the way. PolitiFact: True. As it turns out, the mainstream media’s portrayal of her as the smartest woman in the world is perhaps the biggest fake news story of the 21st century…so far.